It has all led up to this. 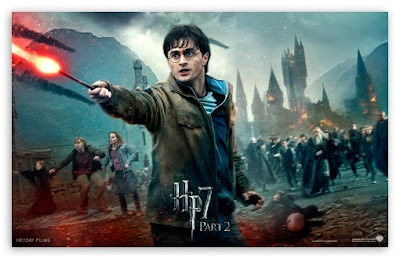 Harry Potter and the Deathly Hallows, Part 2, is the culmination of the seven movies that preceded it - wrapping up all the loose ends and giving final meaning behind all the series' storylines and secrets. In the end, after our central characters have come of age and learned more than classroom studies at Hogwarts, it comes down to three basic kernels of wisdom: 1) there is greater depth to people, if only we take the time to look for it; 2) heroism is forged in courage, goodness, and hope; and 3) evil has no power over selfless, sacrificial love. One of the benefits of stretching a story for seven books (or eight feature films) is that we have the benefit of discovering the rich depth that many of the characters possess. From the first movie onward, we have learned and re-learned the lesson that first impressions and assumptions rarely give us the full picture. In Deathly Hallows, Part 2, the greatest example of this is Severus Snape (played with rich precision by the acclaimed Alan Rickman). Beginning a decade ago with Sorcerer's Stone, Snape has always raised the eyebrows of his students as well as we, the audience, for his sinister tone of voice, his sharp and biting wit, and his dark and suspicious ways. When he killed Dumbledore (Michael Gambon) in Half-Blood Prince, it seemed his reputation was sealed: Snape was indeed an evil man. But in this final installment, we learn that, beneath his brooding veneer, Snape was perhaps the most heroic of characters, risking everything for the sake of Lily Potter and her son Harry (Daniel Radcliffe). There was truly more depth to Snape than we (or Harry) had ever known. J.K. Rowling's convenient plot device of the "pensieve," which allows its users to glimpse into the past through memory strands or tears, gives us the opportunity to see the complete backstory - and open our eyes to a new appreciation of the people we thought we knew. Despite what Harry initially thought of his potions teacher, it is through this incredible moment of exposition that he learns that Snape was capable of great love and affection, of helping others when they needed it, and of admirable restraint when he himself was persecuted (by, to Harry's sadness, his own father and mentors). There was more depth there than Harry ever realized, but unfortunately this realization came too late - as it was only made possible by the tears of a dying Snape. In our social media world, it is all-too-tempting to view people with passing superficiality; and the more "friends" we acquire, the more difficult it is to go in-depth with any one of them. These tangential connections cause us to make assumptions and ignore the rich depth that God gives all people. Harry was blind to see what lay beneath the hard exterior of Professor Snape - and it was too late when he finally learned the truth. Who in our lives are we being superficial with? Who do we know only in passing - and are they worth more than such a weak relationship gives us? In this last film of the series, we finally get to see the depth of emotions that Slytherin bully Draco Malfoy (Tom Felton) possesses. Torn between his allegiance to his parents, his long-held prejudices, and his growing conscience, it is sad that we get to see so little of Draco's struggle (perhaps we'll see them in the deleted scenes?)... but again in his character development, we get to see the depth we all have - if only we take a moment to look a little more closely. Throughout the series, the filmmakers have pushed our focus towards the three central characters: Harry, Hermione (Emma Watson), and Ron (Rupert Grint). Through all their adventures, we have seen the heroism of these three friends shine through with admirable radiance. Consider, for instance, how the trio treated the elves and goblins as equals, unheard of in this fantasy universe - and shocking to the recipients of such kindness. However, in Deathly Hallows, Part 2, we finally get to expand the list of heroic acts - and in some respects, transcend it - by getting a glimpse at the heroism of characters like Luna Lovegood (Evanna Lynch), Professor McGonagall (Maggie Smith), and most especially Neville Longbottom (Matthew Lewis). Their heroism is forged in summoning up the courage to stand against those who would oppress and hurt others. When Harry reveals his presence in Hogwarts in the middle of the film, McGonagall - who up until now has reluctantly stepped forward to stand up to the school's corrupt administration - is filled with a hope she has yearned for all year... and is able to confront the enemy and defend her students. But even more courageous is Luna and Neville who have led the student body in an active underground resistance. More than the adults, these young students face persecution and beatings for their beliefs - yet continue to stand true to their core values and in the hope that goodness will prevail. But perhaps the most telling scene comes near the very end when the evil and victorious Lord Voldemort (Ralph Fiennes) enters Hogwarts with the dead body of Harry Potter being carried in as the prize trophy of his triumph. Even then, as hope seems all but extinguished, Neville steps forward when absolutely no other person would dare to tread. Courageous to the bitter end, Neville proclaims that what they fight for is even greater than the Chosen One Harry Potter - and witnesses to the fact that love and goodness is more important, more powerful than anger, temptation, worldly power, and evil. Initially seen as the weakest and most vulnerable student in Sorcerer's Stone, Neville has become the most inspiring one of all in the last act. Are we ready to stand courageously for what we believe in? Are we willing to put everything on the line for our faith and our hope in something greater? Will we risk ridicule, reputation, or even life to make a difference? Heroes are often seen as those with special abilities, popularity, and power - but Neville, like the prophets in the Scriptures, transcend these narrow understandings of heroism. He reminds us what real "heroes" look like... those who go against the grain, stand courageous, and are willing to risk everything for hope and goodness. This love is the one shown by the valiant and brave characters of this series, who offer compassion to all creatures - from Muggle to magician, from dwarf to elf to goblin, from giants to dragons, and from the smartest to the struggling students. This love is the one shown by a mother to her son - so much so that it saves the life of the infant Harry the night when Voldemort came to kill the Potter family. This love is shown by millions and millions of fans around the world who waited patiently through seven books and eight movies and who were inspired to treat others in the non-magical world as Harry treated all he met. But in a special way in Deathly Hallows, Part 2, Harry Potter realizes that the only way to truly vanquish evil was to sacrifice his own life for the sake of the wizarding world. Like Christ, he was frightened but willing to walk towards certain death so that others might live. He embodied the Lord's words, "No greater love is there than this: to lay down one's life for one's friends." (John 15:13). And it wasn't just Hermione and Ron that Harry was doing this for - because for Harry, his "friends" included all people, even those he didn't know and even those he didn't much like. No greater love had Harry than to lie down his life for Luna and Neville, for McGonagall and the Hogwarts staff, for the Weasleys and for his girlfriend Ginny (Bonnie Wright), for the Muggles unaware of this hidden world, and yes, even for the Dursleys, the Malfoys, and all the Death Eaters. To give one's self completely for others was perfect love... and this above all else is what destroyed Voldemort and his evil. It is also telling that, no matter how dire the situation ever was, Harry never used an unforgivable curse. His was always a defensive spell, never an offensive one that would hurt another. Even towards Voldemort, the seventh book recounts, Harry chose not to use a killing curse to win the day... but a simple "expelliarmus" - the most nonviolent spell possible. Because of this selfless act, Harry is able to retrieve Voldemort's weapon and put an end to the destruction. For Harry, this love needed seven years to fully develop. He needed seven years to fully understand the meaning of selfless sacrifice, which ultimately wins the day. He needed seven years of good mentors like Dumbledore, Sirius Black, McGonagall, Remus Lupin & Tonks, Mad-Eye Moody, the Weasley family, Dobby the house elf, and Hagrid to show him the way of maturity, sacrifice, righteousness. He needed seven years of experiences with fellow students like Neville, Luna, Ginny, Fred & George, and of course Hermione and Ron to give him the tools for the end. He needed to forgive and be forgiven by Snape, Draco, Peter Pettigrew, and the Dursleys to fully grasp the meaning of unconditional love. In our own lives, all that God has given us - our experiences, our friends, and even our struggles - are there to prepare us for perfect love and redemption. Harry needed his adventures with sorcerer's stones, the Chamber of Secrets, the innocent prisoner of Azkaban, the trials of the Goblet of Fire, the protective Order of the Phoenix, the secrets of the half-blood prince, and the journey to uncover the Deathly Hallows to prepare him for the final battle of good and evil. So in our lives, what have our adventures at school, at work, with our families, and in all that we have seen and done thus far - taught us? Have we learned anything from the past - so that we are equipped for the future? Have we learned the true meaning of love? Have we grasped the significance of selfless sacrifice? Have we received the hope that goodness, justice, and mercy always wins out over vengeance, violence, and death? If not, then God still has hope in us - that all the previous chapters of our lives have not been in vain - and that we, like Harry, will be ready to stand up when the time comes. One final note... It is inspiring, to say the least, that even though Harry has defeated evil, he relinquishes power in victory just as selflessly as he approached certain death. He drops the resurrection stone in the forest, stops using the invisibility cloak for protection, and breaks the elder wand - to show that true power actually found in the human heart. So even if we have done what God calls us to do - and we find victory over evil - we are not to boast, brag, or lord our righteousness over anyone. This serves as a valuable epilogue as we look ahead to the future. The ultimate victory is not just in defeating the forces of evil, but in bolstering and living out the forces of goodness, compassion, selflessness, and love every day of our life. May all of us have such a wondrous journey as this. Although I agree with almost everything you say; one correction needs to be made. Harry does in face use the unforgivable curses. In The Order of the Phoenix, Harry attempts to use the Cruciatus curse on Bellatrix Lestrange only to fail and be told by Bellatrix that he has to mean it in order for it to work. He also performs the Imperious curse on the goblins and human guards at Gringotts when he is stealing the horcrux from Bellatrix's vault. He does not use the killing curse, but he does use the other two unforgivable curses, on both humans and goblins. Other than that, excellent review and great questions to think about. Michael, thank you for your comment and yes, I stand corrected. Just a note on the imperious curse at Gingotts... it seemed to be a more benign version of the curse in the film... as the goblins and guards seemed placid and peaceful rather than tortured and in pain, as we've seen other dark wizards do to their victims. In a sense, your reminder reminds me that Harry is not perfect. One would hope that he learns from his mistakes and vows to never use such dark work in the future. It also challenges us to look at our own shortcomings, when despite our best intentions to be our best, we stumble into sin. We must always remember to acknowledge our sinful acts, seek forgiveness from God, and strive to make amends if we have hurt others, ourselves, or our relationship with the Lord. Thanks again for the correction - and for the stimulating discussion. Noel, thanks also for your comments as well. Blessings! I agree that Harry using the unforgivable curses brings up the reflections you relate to it. This is another reason I enjoy the books so much. All of humanity is broken, and all of humanity is redeemable. Even Dumbledore confesses to succumbing to the power of owning the Deathly Hallows. Harry proves stronger than he does in destroying the Hallows. Yet Harry is not perfect. Everything Snape says about him is completely true- arrogant, disdain for the rules, etc.- but yet through his brokenness the good is able to be achieved. Same with us. I also think it interesting to compare the 'redemption' of Snape and Narcissa Malfoy. The repentance of the Malfoys seems to be quite selfish where they simply slink away from the battle, whereas Snape ultimately dies for the cause and ultimately the person for which he is now aligned. I think a comment that receives too little consideration is Dumbledore's to Snape during his confession. Snape tells Dumbledore "nobody can know". Dumbledore, seemingly rhetorically, asks back "nobody must know that which is best about you?" What is best about him? That he knows that he still has a role to play in the salvation story for the good even after his greatest betrayal. This is what separates him from Judas- he came back and accepted the forgiveness and changed his life. Might that we could all be as brave as Snape when we fall!